What does intergenerational collaboration look like? 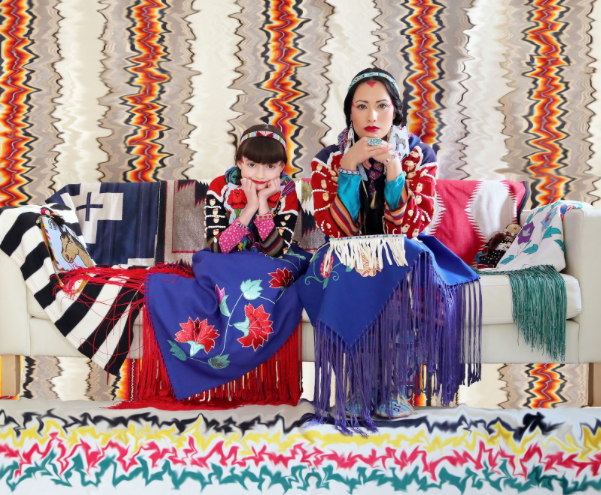 As a mother / daughter artist collaborative duo working in the realm of Native history, identity politics, cultural subversion, and reclamation, Wendy Red Star and her nine-year-old daughter Beatrice Red Star Fletcher probe the colonial thought bubble with intergenerational collaboration and institutional critique. Working with museums like the Denver Art Museum, Portland Art Museum, and Seattle Art Museum Beatrice and Wendy engage the public to decolonize thinking around Native American art and collections through performative tours, interactive activities, and interventionist installations. Intergenerational collaborative work is integral and a means to creating a forum for the expression of Native women’s voices in contemporary art.